Having salce (saljeh) on hand sure makes cooking Turkish easy. Keep a container in the freezer and just take out a spoonful as needed. Salce is used in recipes coming soon to this blog: dolma (green peppers stuffed with rice, parsley and salce), Turkish French fries (salce is so much better than ketchup! ), mercimek (lentil soup), and easy chickpeas. 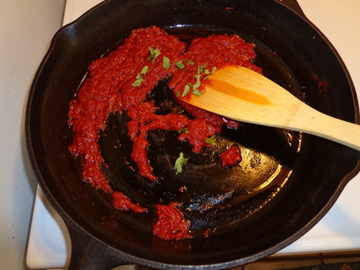 Salce is full of cancer-fighting lycopene. It’s used a spice paste, so it’s very salty and spicy. Most families I knew in Turkey dried their tomatoes in the sun on the roof of the house. But, we will use tomato paste. 1 teaspoon fresh chili sauce (or more) You can substitute with the chili you usually cook with- chili powder, blatt paprika or fresh green chili- adjust the amount but make it very hot. Mint (optional) 1 teaspoon dried or ¼ cup chopped fresh. 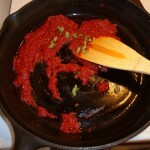 2- “Kill” the tomato paste by adding it to the hot oil and stir to mix. 3- Add chili and salt. When the tomato has absorbed most or all of the oil, add the mint. It should taste very salty and spicy-hot. Hi Sheila- thanks for stopping by! Yes, these recipes are super-simple. I lived in a small village and no one had much money- meat was only for special occasions. Also, I want to mention: “c” in Turkish sounds like “j”. If the c has a little cedilla or tail under it, is pronounced “ch”. Therefore, beautiful in Turkish is spelled Cok guzel, but it is pronounced Chok guzel and salce, that versatile sauce, is pronounced “salje”.